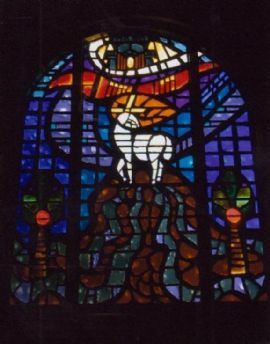 The Four Rivers of Paradise are depicted as flowing from a mount on which the Lamb of God stands. The four Rivers can easily be interpreted as the four Evangelists preaching the Gospel throughout the world. The Gate of Heaven is symbolized at the top pf the window. According to Pope Innocent III (died A.D. 1216), Pison (Phison) is John, Gihon (Gehon) is Matthew, Tigris is Mark, and Euphrates is Luke. 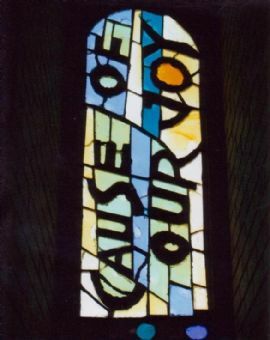 “Cause of Our Joy”. The window shows a traditional Christmas tree and a gift wrapped package in celebration of the birth of Christ. The Holy Spirit is the soul which quickens the body of the Church. The Church’s life is drawn from the Holy Spirit. So too, the Holy Spirit guides man, making his actions more God-like through the gifts of the Holy Spirit. The Annunciation is depicted as showing the Virgin kneeling in prayer being interrupted by the Archangel Gabriel coming to announce to her that she will give birth to Christ. 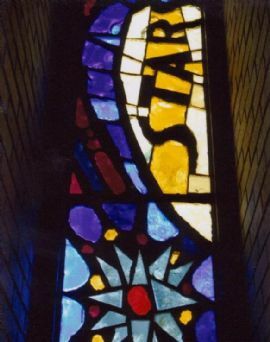 The lily held by the Archangel Gabriel and also shown at the base of the window is symbolic of her purity. 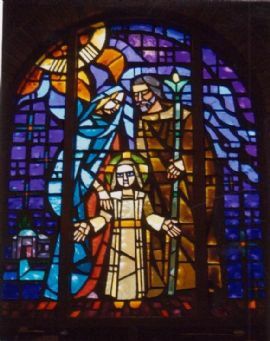 The Holy Family is a model for all. We look to them for guidance and hope that we may follow their example toward peace and harmony in our lives and in the family of man. “Mystical Rose”. 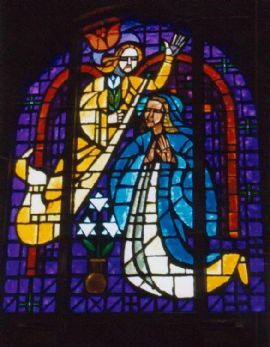 This window relates to the Virgin Mary as the “Mystical Rose” because she was exempt from the consequences of original sin. Upon entering the church one suddenly becomes aware of the beautiful large Facted Dalle Glass windows behind the altar (Sanctuary area). The three windows are united as one with the design of outspread wings. 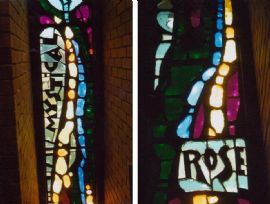 The design of the window was conceived as a background for the statuary figure of the Resurrected Christ. 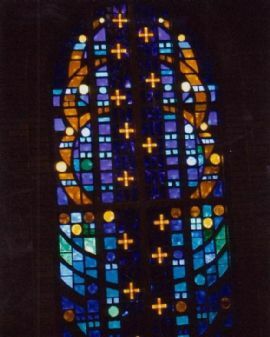 The center area has darker blue colors in an upward direction symbolizing Heaven. The gold crosses upon the blue background symbolize our Lord’s kingly office. At the upper area of the center panel, you will notice what appears to approximate three circles (The Trinity). In the center of the two side panels, the indication of wheat is suggested, wheat is used to suggest the bounty of the earth but in relation to Holy Communion, it symbolizes the bread of the Eucharist. “Morning Star”. 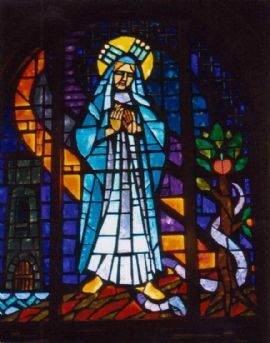 One star is a symbol of the Virgin in her title “Stella Maris”, Star of the Sea. 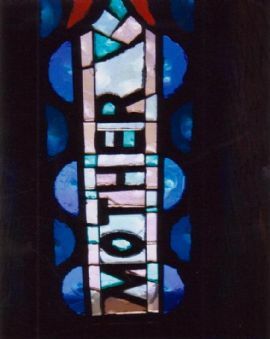 “Mother Most Amiable”, Depicted is a heart surrounded by flames which is symbolic of her intense devotion. 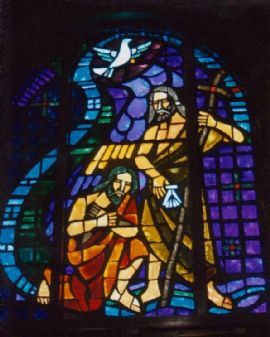 Christ being baptized by John the Baptist in the waters of the Jordan. In receiving this rite Christ sanctified baptism and gave St. John the opportunity to fulfill his role as Precursor by announcing the coming of Christ to the multitudes. The twelve stars shown near the Virgin’s head is symbolic of her bearing of Christ without loss of her purity. The tower shown at the left is symbolic of the strength of the Blessed Mother, and that she is the model of inviolable purity. The Virgin Mary is also shown stepping on a snake descending from a fruitful tree (being free from original sin). “The Sacrifice of Christ for all mankind”. 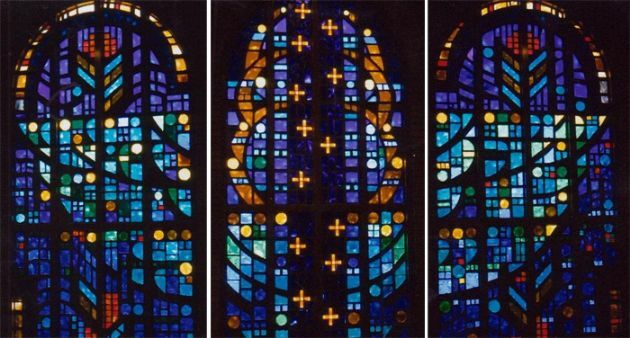 Both windows are the same and depicted is a Cross, cluster of grapes, Eucharist and a Chalice.